Photo Gallery shows Frank's Bears, Frank in action and his fine art pieces. For many folks, being greeted by bears upon entering the outskirts of Schroon is either a sign you are home or on holiday. 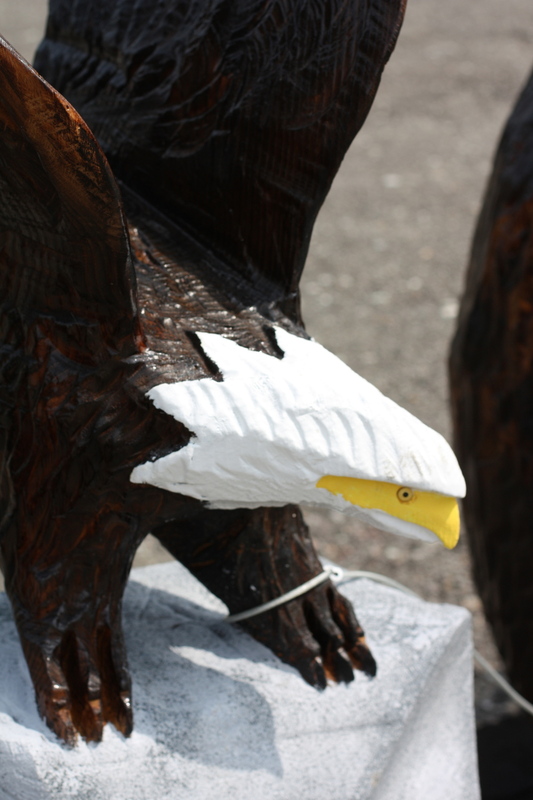 We are not talking about those wild beasts that roam the ADKs -- and love to eat trash -- but the chain saw carved sculptures by Frank Cavoli. If it’s not the bears that catch the eyes of folks who have taken exit 27 off the Northway -- and later make the left hand turn onto Route 9 -- then it’s the soaring eagles or moose that remind you you’re back in paradise. 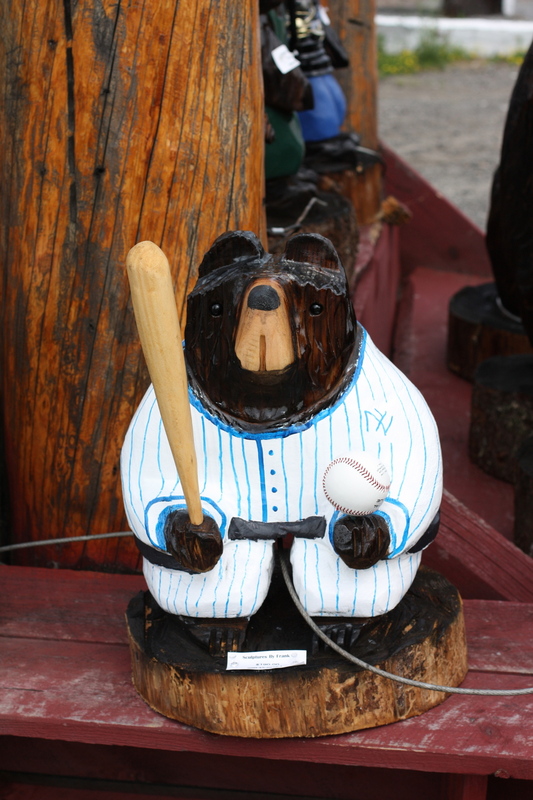 Frank has carved for almost two decades at his shop (next to the new Paradox Brewery) and it has been mostly bears. So how many has he carved in his career? “At least 35,000,” Frank told Schroon Laker on a recent visit. Frank, a fine arts sculptor, who started working with marble crafting abstract pieces, fell into the bear carving business by chance. “I was raising my 6 month old son and restoring a 150 old Victorian in Schroon, which needed a lot of work. 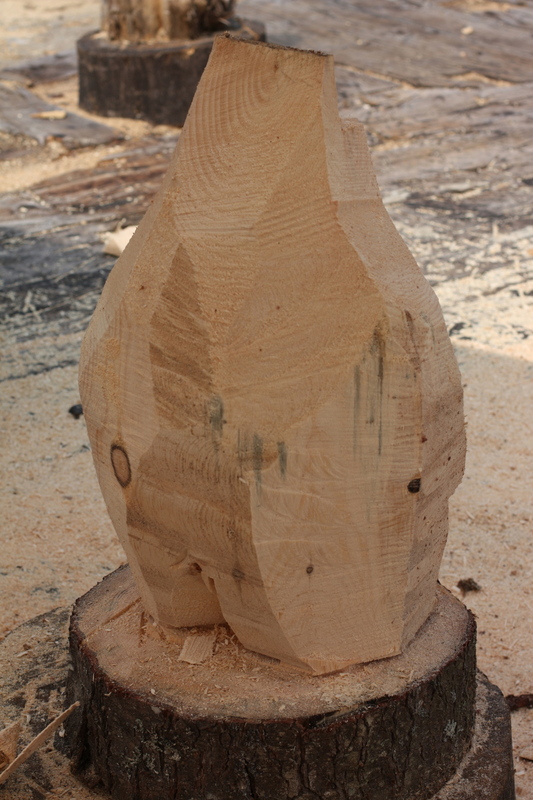 “As time passed, I started carving with a Sawzall (a reciprocating saw) doing fine art and in the abstract. A guy called up and said: “Make me a bear.” That’s basically it”. The design of the bears took its current form over five years. Frank works with pine, which is readily available, “easy to work with, and dries fast”. And fast also describes the speed at which Franks works. Lightening fast! From block to bear, it seems like it’s done in less than ten minutes! 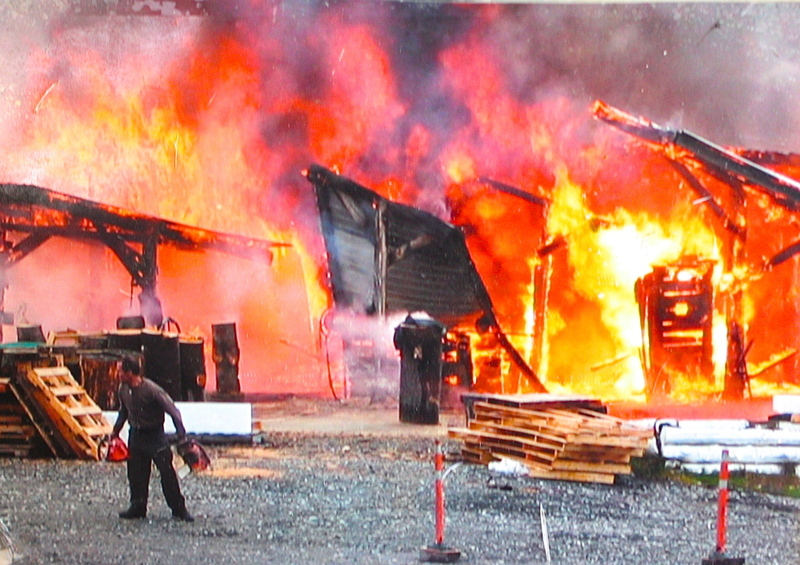 The process then involves applying a flame to give the bears their unique color, before several coats of lacquer. But it’s not his carved bears Frank is most proud of. “I really do love the fine arts work. I’m really proud of a 20-foot tall bronze coated abstract on Redwing Road”. 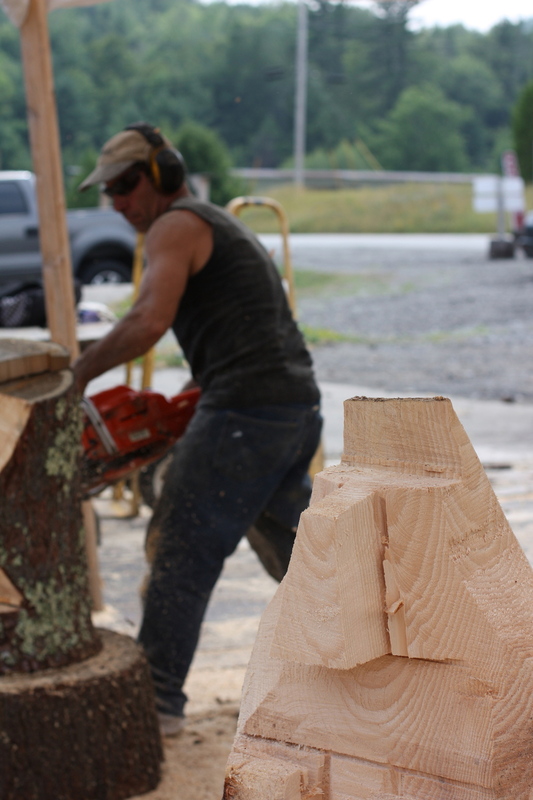 "He is most grateful for still being able to carve here in Schroon, after a fire reduced his business to rubble, more than 10 years ago. He had just returned from wintering in Florida and was re-opening his shop on a chilly spring day. “It was brutal, absolutely brutal,” Frank recalled, while looking at a photo on the wall of him running from an intense red fireball. While he doesn’t know for sure what happened, he believes a spark from his furnace started the blaze. “The fire was so hot it was singing my hair. It took 4 years to get back on my feet to rebuild the shop and expand it. A business, one day he hopes that his son, Frank Jnr, also a wood carver, will manage. “He’s learned by working beside me in the shop. When he was ten, he got his own saw, revved it up and started carving critters. These days, it’s not just critters that are keeping the father and son team busy. For the past 18 months Frank has been using a duplicating machine to carve a variety of smaller pieces, mostly fish and aquatic life. “I was inspired by seeing it on TV, and my buddy Jim and I built together. This machine is pure simplicity, compared to other machines on the market. In the future, Frank would like to concentrate more on the fine art side of his business and eventually like to teach youngsters his craft. “I’d love to be able to apply for grants and turn this into a school,” he said, smiling, before revving the saw and attacking another block of pine!